The Ugandan government has given Ke-Hong Group 2,500 acres for a multi-billion shilling project involving rice farming, poultry, horticulture, and fish farming. Above, the opening ceremony in Ngaaju-Ndibilungi village, Butambala sub-county in Luweero district, April 2016. First, they sold us their made-in-China goods; then they came to build our roads; then they rode on the roads into our shops, hotels and supermarkets; and now the Chinese are in Uganda’s gardens growing food to sell abroad. 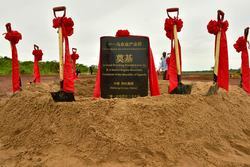 The latest evidence that China is digging in came last Tuesday in Ngaaju-Ndibilungi village, Butambala sub-county in Luweero district, where the government has given Ke-Hong Group 2,500 acres for agricultural production. And the seal of approval couldn’t have come from any higher: President Yoweri Museveni and his deputy Edward Ssekandi travelled to rural Luweero to commission the China-Uganda Agricultural Industrial Park.